Don Smith (California, United States) on 2 November 2013 in Landscape & Rural. This is another image that I reworked using Tony Kuyper's TRIPLE PLAY Action. 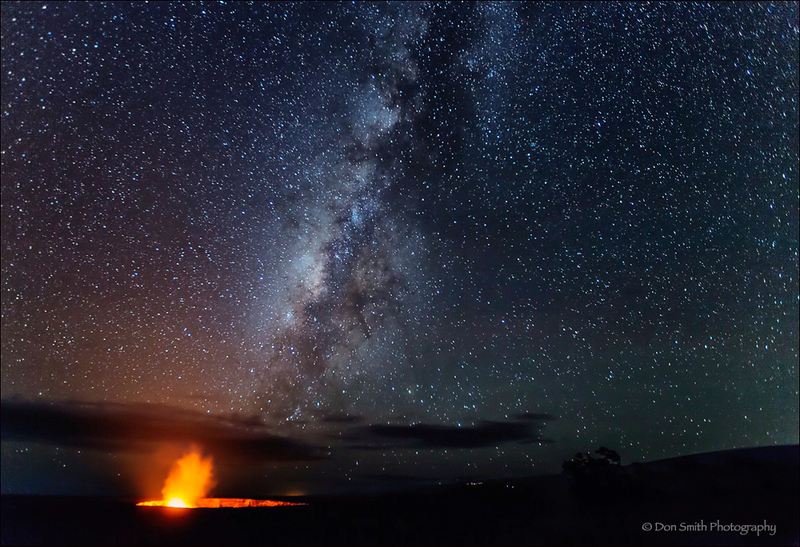 This image was captured in September at Hawaii's Volcanoes National Park. The TRIPLE PLAY helped to bring out the Milky Way that sat above the caldera while giving more "pop" to the stars (and no new noise) - pretty cool! E X C E L L E L T !!!! Fabulous image! This is just gorgeous! Beautiful photo ... I like the implications presented here. The terrifying power of a volcano (we can see a hint of that power here) pales in comparison to the sheer grandeur of the Milky Way. Kind of puts things in perspective. @Footloose Ferret: Makes one feel very small within its presence - indeed. the Milky Way looks absolutely magical! superb processing work indeed! @DarkElf: Still playing with it DarkElf, but I am liking the look. Wonderful composition and technique. Maybe a spotlight. Very close to the one of the 06/09.